If you’ve noticed buckwheat pancakes being offered on brunch menus and spelt loaves lining supermarket bread aisles, then you’ve noticed the trend: Ancient grains are making a comeback and are definitely worth trying- especially during pregnancy. Consuming ancient grains can add variety and important nutrients to a pregnant woman’s diet. Among these are fiber, protein, calcium, iron and B-vitamins. Each grain has different nutritional benefits to offer, so adding a variety of grains can help increase the overall quality of the diet, ensuring that a woman consumes all of the vitamins and minerals she needs for a healthy pregnancy. Many ancient grains are gluten-free, making them a great substitute for women with a gluten-intolerance or Celiac Disease. It is recommended that pregnant women consume 25-35 grams of fiber a day, and this can be made easier by consuming ancient grains since they are usually a great source of this important nutrient. Ancient grains are also a great source of protein, such as in the case of quinoa, which is a complete source of protein as well as being rich in iron, phosphorus, and potassium. Spelt, buckwheat, amaranth, quinoa and oats also contain more of the amino acid lysine which is low in most wheats, making these types of grains a more complete and available source of protein for the body. Don’t forget, during pregnancy it’s ok to consume some grains that are not whole because processed grains have been enriched and fortified with important nutrients that are needed in higher amounts during pregnancy. Fortifying food adds nutrients not found in the original food, such as folic acid and iron in the case of grain products. Some of a pregnant woman’s grain intake should be from these fortified grains to ensure that enough folate and iron (important pregnancy-nutrients) are consumed. For double the fiber, swap rice for farro, an ancient strain of hard wheat used commonly in Italian cooking. For almost the same amount of calcium as you’d get from a cup of low-fat cottage cheese, switch up your morning hot cereal for cooked amaranth which provides a similar consistency and flavor as oatmeal. You can also add amaranth to pancake mix and replace up to ¼ of the white flour in a recipe for amaranth to get a nutrient-boost. 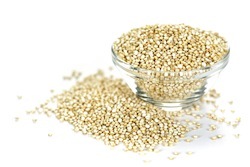 Amaranth also contains 9 grams of protein- the same amount you’d get in an egg. To add some fiber to soups and stews, add some sweet and slightly chewy-textured barley. For a good source of manganese- a mineral which plays an important role in building strong bones- add buckwheat flour to recipes. Buckwheat is also a good source of protein. It works well as a base for muffin or pancake mixes.